This month we celebrate Pentecost, the event that marks the start of the explosive growth of the early church. Forty days after He rose from the tomb, Jesus ascended into heaven, as we read in Acts 1. Ten days after that, the disciples were gathered together in Jerusalem for the Jewish harvest festival that was celebrated on the fiftieth day of Passover. While they were indoors praying, a sound like that of a rushing wind filled the house and tongues of fire descended and rested over each of their heads. This was the outpouring of the Holy Spirit promised by God in Joel 2:28-29. Suddenly empowered to proclaim the gospel of the risen Christ, the disciples went out into the streets of Jerusalem and began preaching boldly to the crowds gathered for the festival. By a miracle of the Holy Spirit they were heard speaking in the native languages of the crowd who had gathered from all corners of the Roman Empire. This created a sensation. The apostle Peter seized the moment and addressed the crowd, preaching to them about Jesus’ death and resurrection for the forgiveness of sins. The result was that about three thousand converts were baptised that day. Read the account in Acts 2:1–41. Better still, join with us in celebrating the birth of the church. The Paschal or Easter candle is an ancient symbol of the risen Christ and commonly used in churches during the Fifty Days of Easter. It is a very large white candle, the largest and tallest of all sanctuary candles. 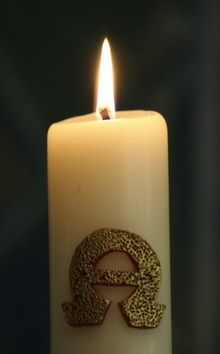 Paschal candles are always inscribed with a cross, the current year, and the Greek letters Alpha and Omega, signifying that the Lord is present in His church now in the present year and forever in eternity. We light our Paschal candle from the “New Fire” at the Easter Day service and place it in the sanctuary. According to ancient liturgical tradition, it shines continuously throughout the Fifty Days until it is finally extinguished on Ascension Day after the reading of the gospel. After that, it is placed near the font and is lighted at baptisms to remind Christians that in baptism we are crucified and raised with Jesus. The candle is also lighted at Christian funerals as a reminder that those who die in Christ are raised up with Him. Join us as we celebrate our Saviour’s rising from the grave, and the new and eternal life this assures us. Christ’s redeeming death on the Cross took place at a particular place and at a specific time in history, but it is an event with roots in humankind’s beginnings, and with continuing consequences. A crude and brutal Roman cross of wood, yet one that has been described as “casting a shadow that reaches as far forward as eternity, and as far back as the Garden of Eden”. In our picture, the wall is mostly in sunlight, and the Cross is not directly visible, but we know it is there; we can’t ignore it; it won’t go away. 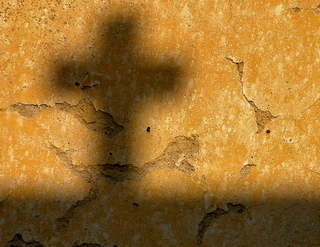 This season of Lent is a time to think about its impact on our own lives. One encouragement for regular Bible-reading, provoking some challenging thoughts, is the series of Lent Reflections from Andrew Herbert of Kinghorn Parish Church, made available through the Scottish Bible Society. And in Rosyth there is an ecumenical Study Group: details are on p25 of the current Contact newsletter, which also contains (on p16) thoughts on the origins of some of our practices during Lent. Let everything fall into place again. May that song be our prayer as we move toward Easter. Do join us throughout our preparation.